Mashbuttons just returned from a week long cruise vacation to Cabo San Lucas and Puerta Vallarta, and upon arriving at home, are greeted with a custom ordered iPad decal from the good folks over at Skinit.com. If you have a moment, go ahead and check 'em out. Skinit.com offers a tremendous variety of design choices to choose from and devices they support. Skinit is basically a large sticker/skin made out of a high-quality vinyl that not only gives a little personalization to your device, but offers a slight level of protection from scratches, etc. There are a number of competitors out there, so what sets Skinit apart is their quality of prints (very high mind you), the personalization options (a ton of designs from simple patterns to a whole lot of licensed material) and how many devices they support. 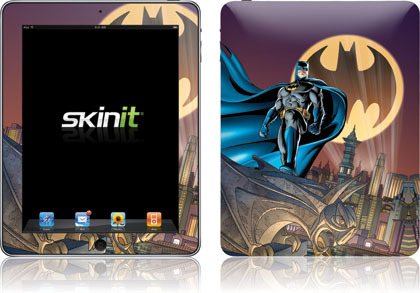 Skinit supports everything from iPods to external hard drives, to all of the tablets. You just find me a device they don't support! Prices will range based on the device you choose, The first iPhone is $14.95 - the current generation of iPhones are only $14.99. iPad skins round out at about $29.99. Applying the decal is pretty simply. The only issue I found was the label was shipped in a round container (like a poster roll) which makes the sticker hard to work with initially. I just laid it flat with some heavy books for about 30 minutes, which made it easier to apply. The adhesive back is sticky, but not too sticky to remove, and so you can adjust the position, as these are cut to exact specifications of your device. Arrange, apply and smooth out any air bubbles and in no time, you'll have a nice vinyl cover. Adding this does give you a little more grip when holding your iPad out of a case, so that's always a nice feature. Would make a great gift for those who want to make all of their devices stand out from a crowd. Highly Recommended!